This training will focus on the cultivation of an enriched pranic field and an in-depth investigation of Buddhist Philosophical Principles. Which we mingle with psychological self-inquiry and awareness practices in Yin yoga asanas. This course offers advanced anatomy and physiology, Yin and Yang posture, clinics / asana labs, Restorative yoga, neurophysiology of the autonomic nervous system, traditional Chinese medicine meridians, and methods for routine mindfulness. During this training, you will be staying at Baja Zen in Baja California Sur, Mexico. The accommodation is in a basic bedroom or glamping style, it is available in a single and double occupancy basis. Yin Yoga is a transformative and rejuvenating practice that seeks to mindfully lengthen and lubricate the connective tissues, by practicing the methods of stillness, mindfulness, and loving-kindness. This practice is an opportunity for neuroplastic molding of the rest and digest function of your brain, empowering practitioners to beckon the brain into a restful and restorative Theta Brain Wave state to increase immunologic function. Radiating with ritual, this integrated wisdom practice is a tool to rise to your intrinsic baseline of tranquility, recall your innate ability for spaciousness and remind your system of its unique anatomical, structural, and emotional wholeness. This training will weave in a special focus on three primary vital centers of the Chinese Meridian system: earth element, water element, and fire element. Beginners are welcome but a background of interest or experience in mindfulness and some experience in Yoga asana (Yin or Yang) is required. This training covers the advanced principles of the 5 elements and the 8-fold path. Delve into a rich and robust restorative practice to increase vitality and surrender to your system's innate wisdom. 09:30 - 10:30 Mindfulness module arrive and center. What is mindfulness. Dukkha and seated posture. Internationally celebrated yoga teacher, Kali Basman enriches the paradigm of Yin yoga to integrate distinct aspects of self into an innate wisdom practice to awaken a rich inner life and radiate with ritual. Her offering honors Yin yoga is a tool to surrender to the intrinsic wholeness. On the textured path of mindful healing, Kali is celebrated for her integration of the 5 Elements and Chinese Meridian Theory with self-inquiry, embodied anatomy, Buddhist philosophy of equanimity, and sharp intellect. She leads training and retreats around the world. Daily meals are included in this training. 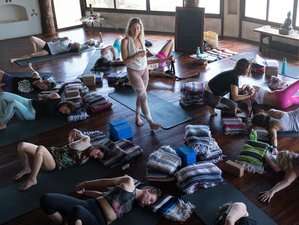 Durga Excursions is a conscious collaborative offering worldwide Teacher Trainings & Retreats dedicated to the living discipline of Yin Yoga.